Who's off to Europe? Not me! But the fashion week crowd is wrapping it up and moving on out there. Goodbye! My job is done and I'm happy to say…I survived NYFW 2016!!! Now where's my treat? How fun is this packaging? My signature wink girl has branched out. 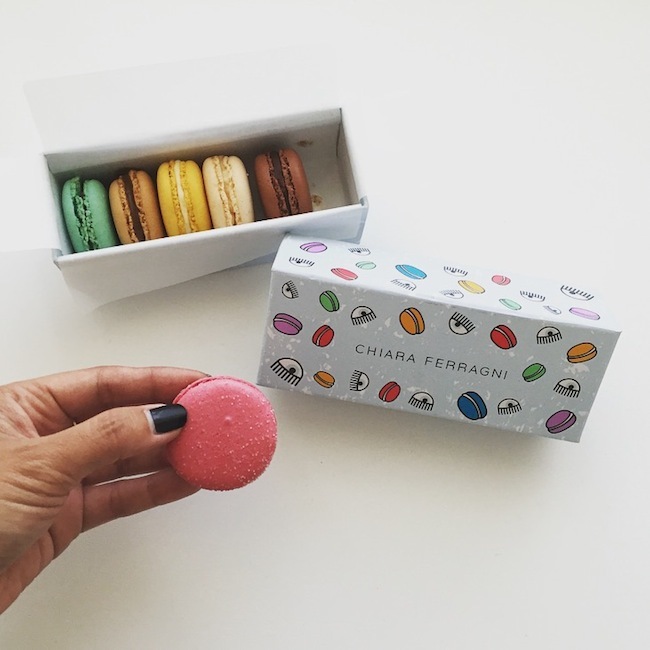 Laduree macaroons has collaborated with designer Chiara Ferragni a.k.a The Blonde Salad, in lieu of fashion week. Sold as a package of 6 scrumptious macaroons per box. You pick and choose your own flavors. Try the pink 'Blonde Salad' strawberry-vanilla special flavor. YUM. Limited special on till the end of September or when they sell out of the designer boxes. Ending my week on a sweet note. How about you? Treat yo' self…it's Fri - YAY y'all!